The Woolpack is a traditional country pub in Huddersfield, where they often host quiz nights, live bands, televised sports, pub poker and other social activities. The Woolpack needed a communication solution that was simple to operate, cost effective and direct to let customers know of live events. They created an opted-in list of their regular customers who had expressed an interest in being kept up to date with reminders of upcoming events. 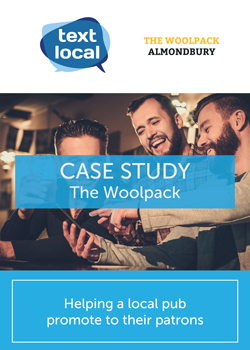 Download and find out how The Woolpack have been able to increase the number patrons attending their live events.